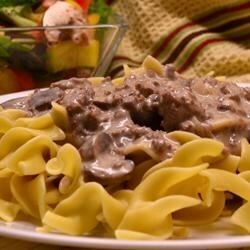 "I couldn't find a beef stroganoff recipe using ground beef that I liked anywhere, so I asked on Facebook, and one of my friends messaged me her personal recipe, which I tried and loved! Serve over egg noodles." Heat a large skillet over medium-high heat. Crumble ground beef into the hot skillet; season with salt and pepper. Cook and stir beef until completely browned, 7 to 10 minutes. Drain and discard any excess grease. Transfer beef to a bowl. Melt butter in the skillet over medium heat. Cook and stir onion and garlic in hot butter until softened, 3 to 5 minutes. Stir flour into onion mixture; cook and stir until flour is browned, about 1 minute. Return beef to the skillet; stir. Pour beef broth over the mixture in the skillet; bring to a boil. Stir Worcestershire sauce and mustard through the mixture. Place a cover on the skillet, reduce heat to medium-low, and cook mixture at a simmer until the consistency is gravy-like, about 1 hour. Stir sour cream and cream cheese through the beef mixture to serve. Excellent!! Smooth taste! I added portabella mushrooms and scooped the Storganoff onto a baked potato. I am passing around the recipe and will definitely make it again!!!! Yum! Added fresh sliced mushrooms with the onion, and only needed to cook for about 10 minutes before it thickened up. Delicious! !